Ancillary study to STAMPEDE study measures the five-year outcomes of bariatric surgery versus guideline-recommended intensive medical therapy on bone turnover in obese patients. Cleveland Clinic researchers from the Department of Endocrinology, Diabetes and Metabolism and the Bariatric and Metabolic Institute have been collaborating to minimize the progression of type 2 diabetes in obese patients for some time. 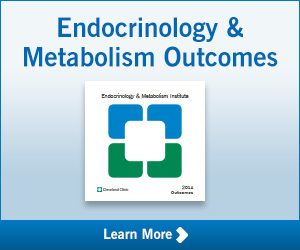 Last year the group published five-year outcomes from the groundbreaking STAMPEDE study showing the benefit of bariatric surgery in these patients, including significant improvements in weight loss, glycemic control, triglyceride and HDL cholesterol levels, use of insulin, and quality of life. Now, the group has just published findings from an ancillary analysis of the STAMPEDE data. This analysis shows that while the benefits are sustained five years post-surgery, these patients do have chronically elevated bone turnover markers, a sign that they are at increased risk for fractures. “Our study validates the findings of others, namely that these patients face increased risk for both osteoporosis and fractures,” says Sangeeta Kashyap, MD, from the Department of Endocrinology, who was an author on both studies. “While this may be a drawback, we have to weigh the risk of potential fractures against the benefits of improved glycemic control achieved by these surgeries. At five years, both surgical groups had noticeably significant percent increases in CTX and OC compared to the IMT group (see table). The decrease in BMI was related to increase in CTX for all 95 patients. While the surgical groups also had significant increases in PTH, the IMT group did not. However, the authors note that PTH values did not differ significantly among the groups at five years. Twelve patients reported 13 fractures during the 5-year period, including 11 in the feet/ankles and two in the distal arm/hand. While these data demonstrate a correlation of increased bone turnover after weight loss, not a causative relationship, Dr. Kashyap notes they do show that patients who undergo bariatric surgery will need on-going monitoring for increased bone turnover. 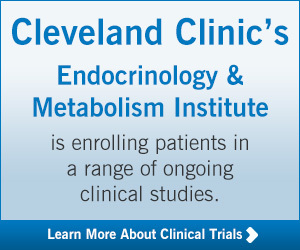 A site for physicians and healthcare professionals from Cleveland Clinic’s Endocrinology & Metabolism Institute, ranked #3 in the nation by U.S. News & World Report. Get the latest insights on research, innovations and clinical expertise.